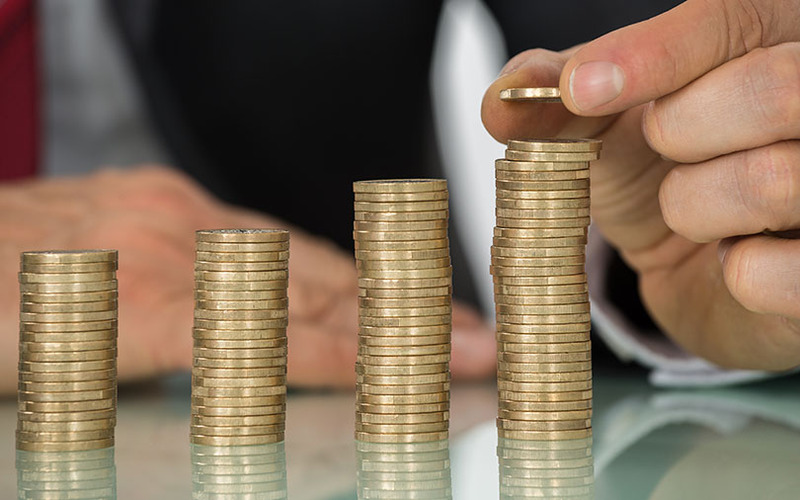 The boom in initial public offerings in India this year has helped equity capital market transactions overtake private equity deals by value after almost a decade, a VCCircle analysis shows. [auth-user]The boom in initial public offerings in India this year has helped equity capital market transactions overtake private equity deals by value after almost a decade, a VCCircle analysis shows. PE investments in India had started rising from 2007 and hit a peak in 2015 before tapering off last year. Meanwhile, fundraising from the public markets had slumped after the global financial crisis of 2008. Although overall public-market fundraising recovered two years later, the IPO market remained moribund until 2014 and picked up pace only the following year. 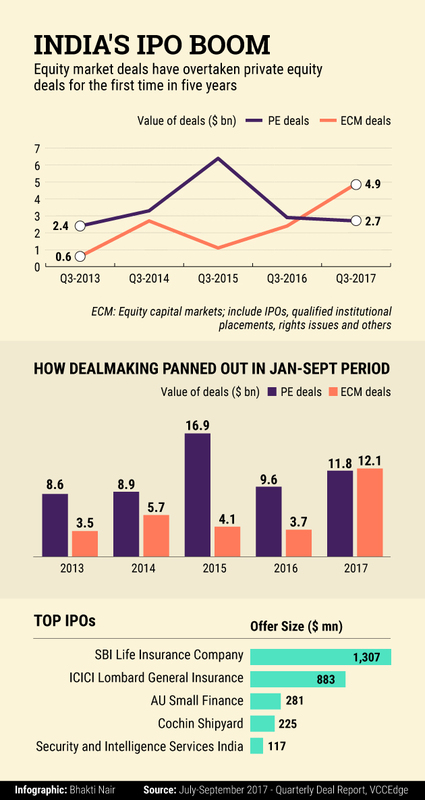 Fundraising through equity capital market (ECM) deals has gathered momentum this year with Indian companies mopping up as much as $12.1 billion during the nine-month period ended September. This is higher than the $11.8 billion worth of PE investments during the period, according to the Quarterly Deal Report by VCCEdge, the data research platform of News Corp VCCircle. The trend was similar in the July-September period as well, with ECM deals at $4.9 billion surpassing PE deals worth $2.7 billion, the report showed. ECM deals in the third quarter doubled from a year earlier thanks to the flood of IPOs. There were 38 IPOs in the three months through September, accounting for 66% of the total ECM deal value. SBI Life Insurance Co. Ltd’s IPO, which raised $1.3 billion, was the largest share sale during this period. Indeed, fund inflows from domestic as well as foreign investors have been strong this year. Domestic mutual funds have invested a record Rs 82,000 crore into Indian equities in the first nine months this year. And this will only rise as household savings continue to flow into mutual funds. Aggarwal said that another reason causing the rush for IPOs is exits by private equity funds which had been delayed due to poor market conditions. The rise in secondary markets has offered better valuations than in secondary PE markets, prompting private investors to push their portfolio companies to go public. On Monday, benchmark equity indices touched record highs. The BSE’s benchmark Sensex has climbed 25% so far this year. Aggarwal also said that companies will continue to use capital markets over the next two to three years to provide exits to their investors, re-balance their balance sheets and raise funds for growth. Meanwhile, the number and value of PE exits declined in the quarter ended September. PE exits were earlier dominated by open market deals, and mergers and acquisitions. But this year, IPOs have been the most preferred route for exits by PE firms. The biggest PE exit was the stake sale by Canadian investment firm Fairfax Financial Holdings in ICICI Lombard General Insurance Company via the insurer’s IPO for $558 million. Another notable PE exit came via the IPO of AU Small Finance Bank. The IPO saw stake sales worth $234 million by Kedaara Capital, International Finance Corp, Warburg Pincus India and ChrysCapital.